Today, I am celebrating WDD by giving away some incredible stuff! Our first prize is a bracelet from Lauren's Hope! Lauren's Hope specializes in fashionable medical identification jewelry for men, women and kids and has been providing lifesaving medical ID's for over 10 years. 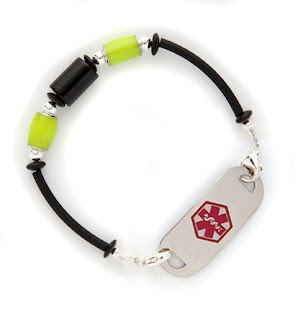 Their medical ID bracelets are custom engraved with you or your child’s important medical information in the event of an emergency and you unable to communicate. Styles ranging from stylish and elegant medical ID bracelets for women, durable medical ID's for men and fun medical ID's for kids make wearing your medical alert a joy and not a burden! The Cake and Kisses Medical ID Bracelet is super sweet and guaranteed to brighten your day! With multi-colored large round beads and small multi-colored seed beads, this bracelet is like sprinkles on icing. 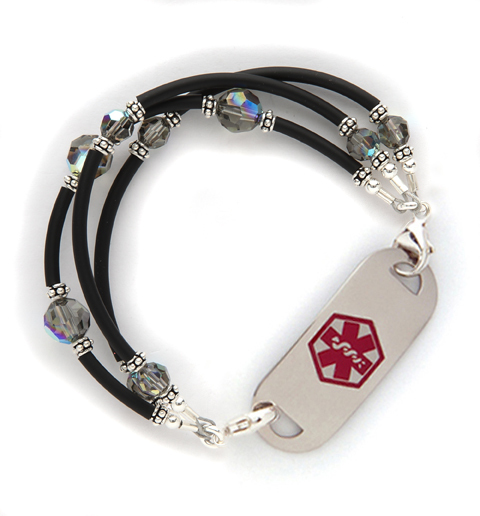 The Fiona Medical ID Bracelet is elegant-yet-modest, you can't go wrong with this triple strand medical ID bracelet. This sophisticated design features black tubing and gray Swarovski crystals to create a look that is subtly stunning. 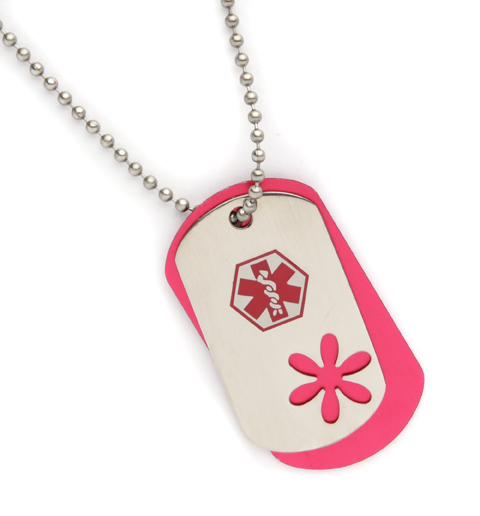 The Hot Pink Flower Medical ID Dog Tag is a classic dog tag necklace with a brand new twist! Lauren's Hope has paired their hot pink aluminum dog tag with the new stainless steel medical ID dog tag with cut out flower to bring you safety with a funky new style. The back of the aluminum dog tag can be engraved with up to 5 lines of your important medical information (approximately 20 characters per line). A black rubber silencer is not pictured but will be sent with the necklace. The Into The Dark Medical ID Bracelet features 2 lime green GLOW IN THE DARK beads. All of the beads are accented with sterling silver and black disks. The sides of the bracelet feature our popular black tubing. It's going to be hard to pick just one, huh? The winner will get their choice of bracelet or dog tag, medical tag, custom engraving, and shipping! If your CWD is a little one, like Sweets, he or she might need the necklace. Lauren's Hope was kind enough to send us one to try out - except that Sweetpea's wrist is still too small for the smallest bracelet. BUT... she sure does love her necklace! It's a nice option for the littles! The second prize is from Designs by Janet D! I found Janet's awesome products on Facebook! I was drawn in by the beautiful necklaces and jewelry she makes! But what really caught my eye were her t-shirts. And I thought.... How awesome would it be if the ball was a blue circle?!? So I emailed her and asked her if she could make one for me like that. And she DID! But not only did she make a shirt for ME... when I asked her if she would be willing to give one away in honor of World Diabetes Day, she said YES! Isn't she awesome?!? So the winner will also get her very own custom made Diabetes shirt!!! I am in LOVE with mine and will be wearing it all week long! A big THANK YOU to Lauren's Hope and Designs by Janet D for being so willing to give away your fabulous products in honor of a day that is so near and dear to our hearts! 1. Leave me a comment before midnight (EST) Thursday, November 17, 2011. Include your first name (comments left with out a name will be eliminated). I just love the bling shirt !!! Let me know if I win so I can sport my new shirt too ! Thanks for all you do. Love your blog!! Love Lauren's Hope! Best medical Id's around. Thanks again for all you do ! I'll be in blue for World Diabetes Day!! I love the Lauren's hope bracelets... they are so pretty! Thanks for the chance to win and Happy World Diabetes Day! Audrey needs a new id bracelet, this would be perfect! Great giveaway! We'd love to win either one. LOVE the Shirt!! Hope I win! Love it! Happy WDD! 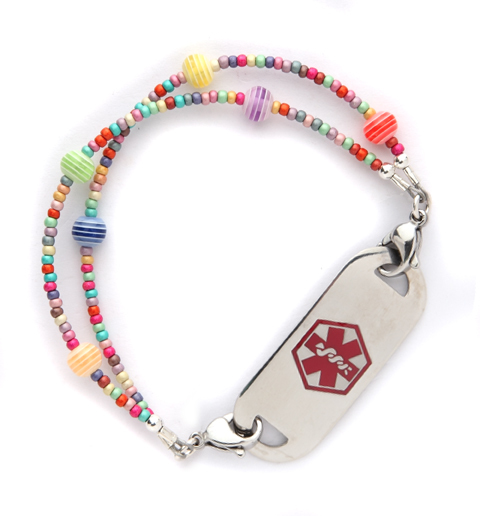 Grace would love the hot pink flower medical ID tag. Love the shirt - it rocks! LOVE the shirt, and the bracelets are the BEST around! Count me in! Thanks for having cool prizes! Hope I win. Love both giveaways! Happy WDD! Love the prizes and your blog! thank you!!! FANTASTIC giveaway, Hallie!!!! I LOVE the shirt! Happy World Diabetes Day to you, J and Sweetpea!! LOVE these prizes! I want to win!!! OH I AM SOOO excited!! I hope I win!!! To cute! I love these pieces my lil one loves hers and that is where we go it. They are an amazing company in the fight for diabetes too!! Hi...I'm Julie. My 10yo daughter was just diagnosed with T1 a two weeks ago. I love your blog and would love to win a beautiful bracelet for her to wear. Thanks for the opportunity. It's Julie again...posted the giveaway on my facebook page. Thanks again! Hi- all of them a awesome! I love that they are all so different. Thanks for the giveaways and your blog. You do an awesome job and I've learned a lot. Oh my goodness...that shirt is amazing! Love it. And, totally need an ID bracelet for Adam. Happy WDD! Another GREAT giveaway! Would love to win!! Thanks! WOW!! LOVE, LOVE, LOVE your blog, Lauren's Hope, and that cool shirt! Hope I win! Amy Wall. Love Love this give away!!!! Will we be able to order a shirt IF we do not win???? This is an AWESOME giveaway! Please enter me! Natalie has a Lauren's hope bracelet and they were able to make it smaller than their smallest size. I just gave them her measurement and it fits perfectly...of course it does not have as many beads as on the website, but it is still plenty adorable and you can add beads as she grows. We love Lauren's designs! The one Jaime is using is from her shop. Hope you had a great WDD! LOVE Lauren's Hope bracelets!!! Love your blog as well... Thanks! Love me some Princess and the pump and love me some free stuff! Posted a link on my FB page! We love Lauren's Hope and that shirt is awesome! Thanks for hosting a great giveaway! Love your blog and love your giveaways!!! Thanks for all the info you share. Last one ... I blogged about it! Awesome giveaway! I would love a new id bracelet and a cute shirt!! Hey! I was blog surfing and stumbled up on your blog! My 4 year old was just diagnosed with T1 on October 17. Its been a WiLd ride the Past few weeks! Thanks for this blog, it gives moms like me some Hope! I'm posting for my sister-in-law who's daughter was just diagnosed with T1. Just tweeted link on Twitter! I would love to win these for my own little sweet pea. Thanks for the chance! -Karen M.
Love the t-shirt! Will repost! I am very thankful for your blog - I feel less alone as a D-Mom and enjoy reading how other D families make it work. All the best to your family. I just found your blog through the parents maazine article. I am so glad I did, I only wish I had found it two months ago when my daughter was first diagnosed. Anyway, thank you for sharing. Those bracelets are great! I shared your give away on facebook. Thanks again for your great blog! We would love to win this! Love your blog! Love it! Would wear all of this with pride!! !